I would love to think I could avoid supermarkets altogether like Team Pugh and I probably could if I was willing to drive to buy groceries. 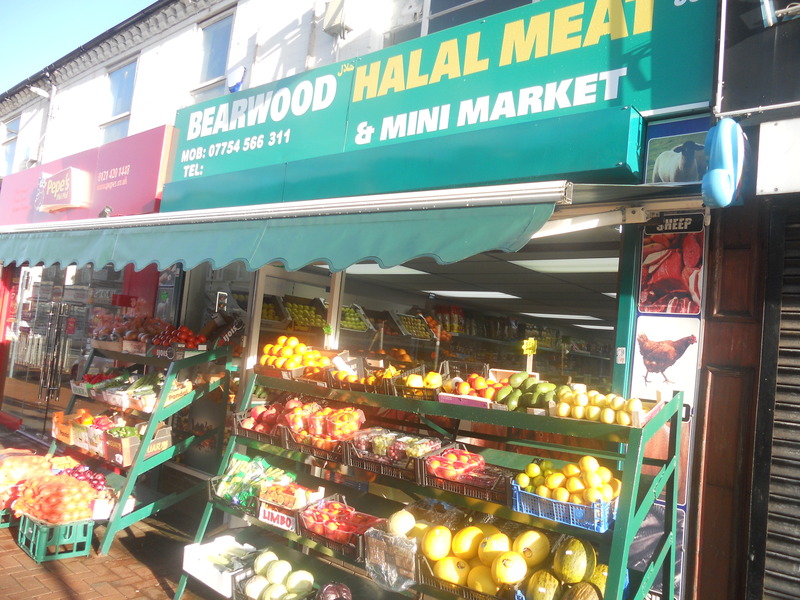 We have some good butchers on my local high street and recently the Halal butcher has increased his range of fruit and veg and everyone who has been there has said how lovely he is. The outside of the shop looks welcoming, which I hope translates into custom. He also sells a good range of tinned items, dry goods, cooking oil and dairy. Of course he has a niche market in the Halal offer and the customer service is excellent. I do shop there occasionally, but he is the other end of the high street, so to carry heavy items from there is an issue for me, and to take the car is also a problem as parking outside is limited. I suppose the solution is to get a shopping trolley! However the real reason, despite me wanting to support indies is that I like to shop at Aldi. It is good value, good quality and meets most of my shopping needs. I usually go on foot and buy what I need each day, and as by being limited to what I can carry this limits my spending too. As it was dreadful weather so I chose to use the car for the 200 yard drive or so and stock up on things that are too heavy to carry. Total spend was £54.29 and that included non essentials such a bird food for £6.99, cleaning and personal hygiene items and some of their excellent New Zealand Sauvignon Blanc which at £5.79 a bottle is a steal. Potatoes were on offer at £2.36 for 5kgs. At less than 50p a kilo I would be hard pushed to get them that cheap at the markets. I am still planning meals on what I have in the house already: dinner Wednesday was pork chops, mashed potatoes, and various veg with a cheese sauce, as I had bits of cheese that need using up and chops in the freezer. 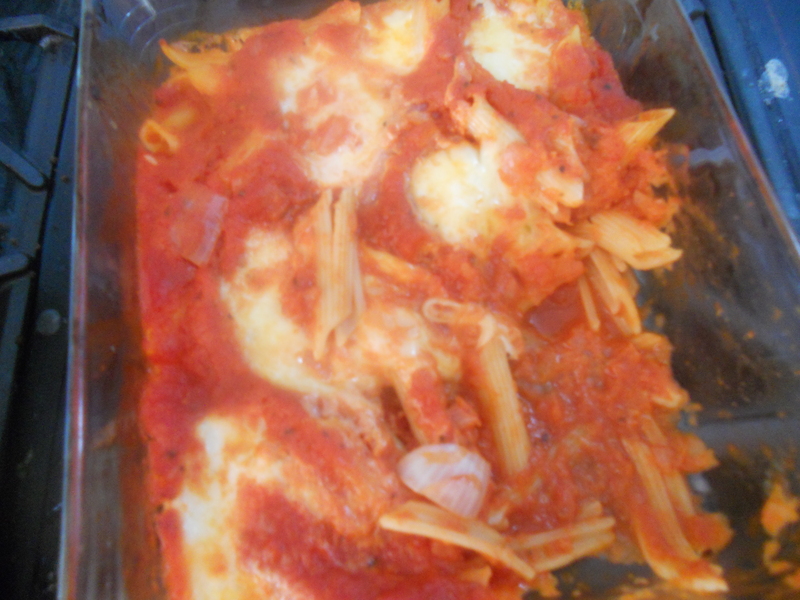 Yesterday I made the pasta bake based on this Jamie Oliver recipe. I have also just found this brilliant meal planning resource from Butcher Baker. 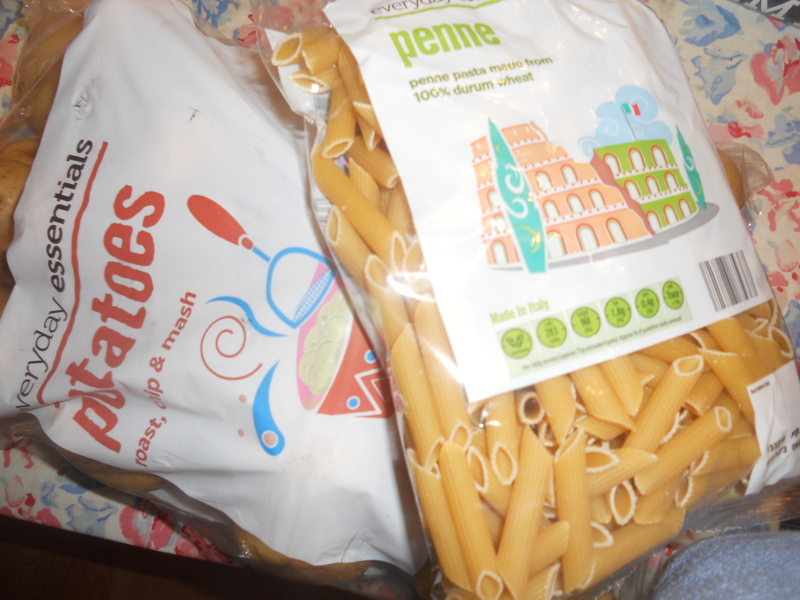 Pasta at 29p for 500 g, why would anyone spend more? What I really like about Aldi is that most of the fresh meat (if not all) is British as is much of the fresh vegetables. We really need to support our farmers. So while I am shopping at a supermarket, it is local to me. I usually walk there and use other local and independent shops and businesses. I am supporting British farmers. Not perfect, but it feels better to me than using Tesco or Asda. I am definitely spending less money and wasting less food by shopping at Aldi. I also visit local farmers markets, usually the one in Harborne, get fresh and dried herbs from Urban Herbs and most of my clothes come from the local charity shops. Next week I have 4 days of only feeding 2 people and am thinking of this being my cook like A Girl Called Jack, to use up the lentils, rice and potatoes as the 2 mouths I am feeding will try anything new. The other mouth The Gamer is off on an Outward Bound type week somewhere in the Welsh Borders with The Princes Trust. His team has to cook once and while he can’t remember where they are going, he has already planned what they are cooking and made a shopping list. And proper cooking, not noodles in pots or sauces from jars and beans on toast. 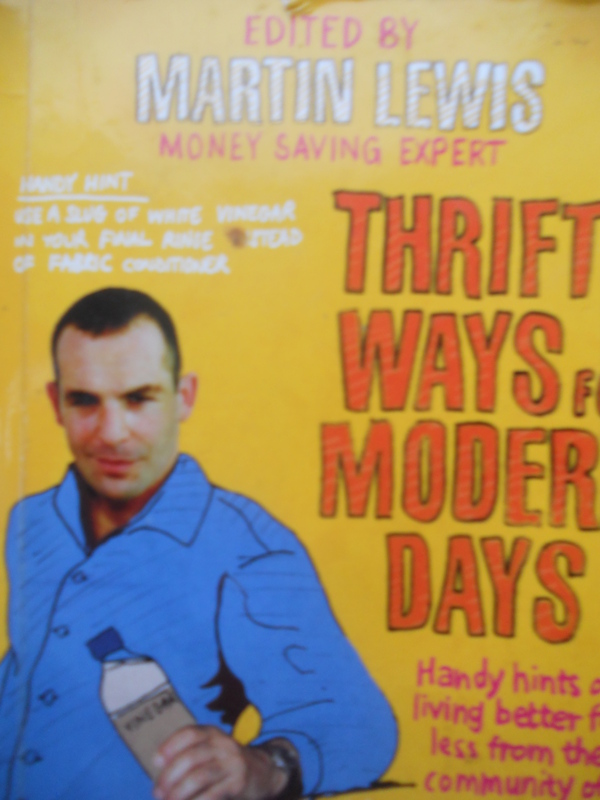 Easy spaghetti bake from this Martin Lewis book. I am doing something right then. What are you cooking this week and what are you not buying? This entry was posted in Food, From the Big Four Supermarkets, Not Buying It and tagged A Girl Called Jack, A Year without Supermarkets, Aldi, Food, Food waste, Jamie Oliver, Local purchasing, Martin Lewis, meal planning, saving money by Travelling Coral. Bookmark the permalink.